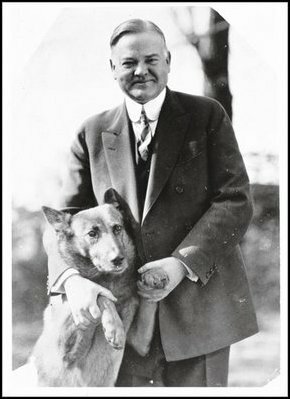 President Herbert Hoover (1929-33) poses with his uncomfortable-looking dog, King Tut, a Belgian shepherd. Circa 1928 photo courtesy Herbert E. French, Library of Congress. When he ran for president in 1928, Herbert Hoover had experience as the wartime food administrator under President Woodrow Wilson and as secretary of commerce under Presidents Harding and Coolidge. However, Hoover had never run for office, and his public image was somewhat stiff and severe. So, in those days before TV, Hoover’s campaign officials determined that a photo of Hoover with his dog might make him seem more personable and approachable. Thousands of copies of this portrait of a smiling Hoover holding up the paws of his Belgian shepherd, King Tut, as if they both were begging for votes, were circulated around the country by the Hoover campaign. The photo worked! Hoover was elected with an overwhelming majority of votes and high hopes for the future. The New York Times called it “one of the happiest pictures ever made” of Hoover. Belgian shepherd and German shepherd breeds — commonly known simply as “police dogs” during Hoover’s time — are known for their intelligence and for their extreme loyalty and protective nature toward their owners. Once in the White House, King Tut patrolled the perimeter of the property’s fences nightly, and he usually seemed worried about protecting Hoover from his many visitors. 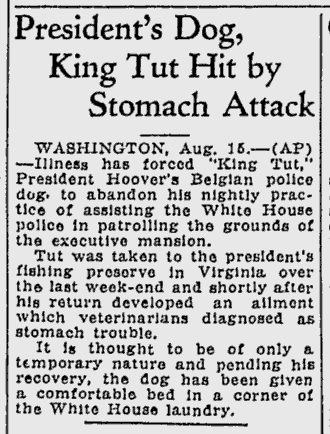 But being a White House dog proved to be too much stress for King Tut — to the point that the dog eventually stopped eating. Hoover sent him to a quiet home away from the hustle and bustle of the White House in the hopes that he would recover. King Tut died in late 1929, at age 8, after having “gradually faded away,” according to an article in The Times [PDF]. Aug. 16, 1929, article about the declining health of King Tut. King Tut had reason to worry. The same year Hoover took office, the stock market crashed — sending America into the Great Depression. The country also was experiencing unprecedented crime fueled by illegal sales of alcohol in response to Prohibition. Renominated by the Republican Party in 1932, Hoover lost his re-election bid by a landslide to Franklin Delano Roosevelt and his New Deal.